Interest in environmental projects like "Ocean Cleanup" and more? Re: Interest in environmental projects like "Ocean Cleanup" and more? A good use for empty oil drums & old bikes. 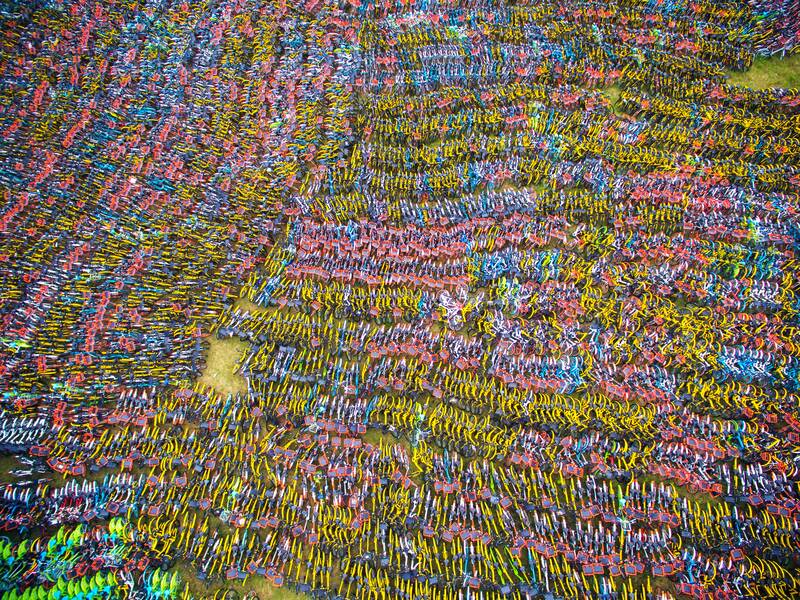 I bet, every big city in China has those mountains of bikes. Now they start driving cars instead...Imagine how this scrap yard will look in ten years! I used to work in bike service business and within 12 month I collected dozends of 'damaged' e-bike batteries. Usually, there was only one cell broken or the wiring/BMS failed. With these 2nd hand batteries you could build a range extender for an e-car or re-use it as solar power buffer. 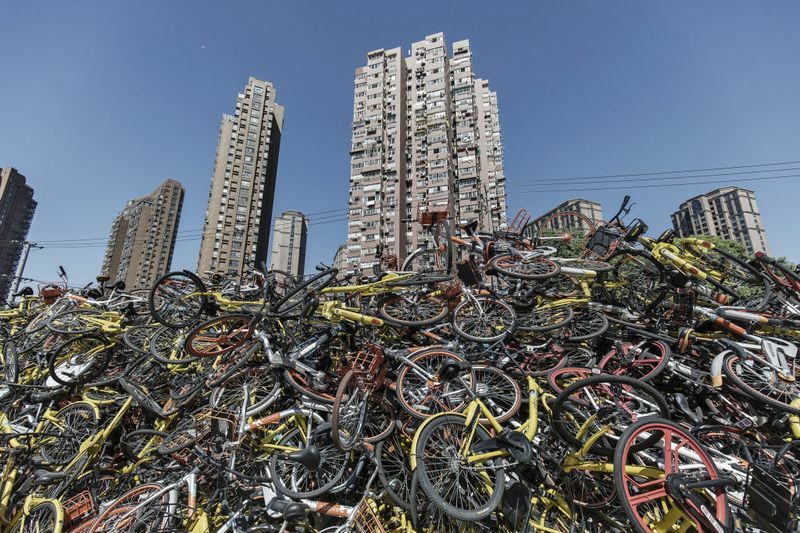 But truth is, there is almost no business dealing with old e-bike batteries. ... "productivity" or "efficiency" are mostly technically and profit-oriented concepts, when size and costs count. In the "wealth without money" view, what Adrian meant for the RepRap project, other problems and solutions can be totally different. So why look at (and pay for) the "most productive" high-tech fabbed wind or solar generator, if low-tech variants in bigger counts can generate the same amount of energy? This too is more in line with the point of view of our for-profit society, what is also the reason for our current environmental problems. I think money is here to stay (barter is more difficult, it's much easier to have a central item you can trade for any other item). Even if it didn't "cost" would still exist in terms of how difficult something is to produce and how many resources it uses. "High tech" is good when it does more for less, when it makes it so things require less resources and processing to be made. We will not dig ourselves out of a garbage hole by making more garbage because "if we make enough of these less effective items it will add up to what we need". Why not do the same thing with fewer resources? That being said, you'll have a hard time curbing resource use when demand keeps growing with a growing population. I'm not saying I have the answer to that problem, I'm not even sure there is a "good" answer to population growth that keeps everyone happy. My $0.02? Aside from recycling and waste reduction, a closer look at passive devices would be good. A lot of pollution (the sort we can't even see) comes from energy production and use. Right now we have active heating and cooling systems, lighting etc. which could all be supplemented or even replaced with passive systems. Reduce energy consumption and energy becomes more plentiful, now you can use that extra energy for recycling which can be quite energy intensive. The best part? "Runs for free" makes it a lot easier to get people to adopt it. Plus this particular one actually removes heat from the planet (from my understanding?) which would be good in the short term. I can imagine it coming back to bite us later when we have a "heat shortage" or something of the like, but we can always kill that particular problem with fire. ... radiation cooling sounds good! For the money-aspect -- I think, not "money" is the problem, but the general expectation that one can let one's money "work" in order to make more money out of a sum ... this is called the "value chain" and fired by interest and compound interest. And the more money you invest, the more can be "earned"! The biggest problem with this is "market saturation" -- the more money "works", the less it becomes worth and other problems grow like "bubbles". Such "money bubbles" can only be dissolved if the excess stock of money is "destroyed" - in the past this was mostly done by wars, today by "market adjustments" which lead to financial crises or the like at regular intervals. Imagine if Flying to the Moon too early was actually a human setback. perhaps if they knew the exact point it/changes to the sytem should be done, ie best for planet not for cash registers. Removing heat from the Planet into out of Space, perhaps we need a bigger hole. Edited 2 time(s). Last edit at 09/17/2018 10:46AM by MechaBits. From my understanding it doesn't work on making a hole, more off which frequencies the atmosphere reflects or absorbs. Not saying it's a holy grail solution, I can imagine it'll have its own set of reprocussions, but just thought it might be of interest. I like vdx's idea of recycling on the molecular level. That would mean a) there is no longer a recycling "cap" for things like plastics where the material can no longer be recycled, and b) it means compounds which are toxic and currently can't be recycled can be broken down and recycled. Has anyone here heard of gasification? It's used to "recycle" organic compounds by turning them into a bio-gas. Not a perfect solution to landfill but it seems like a step in the right direction. At least fuel is usable and co2 is relatively easy to get rid of compared to landfill. This is a very energy intensive process but I believe it works for pretty much any organic compound. Edit for clarity: I'm using "organic" in the chemistry sense, meaning hydrocarbon chains. Edited 1 time(s). Last edit at 09/17/2018 10:02PM by Trakyan. So they keep banging on we need to make more...do more.. use more...buy our 5#!Zzle. for a basically laudable and necessary undertaking but unfortunately without a long-term perspective at the moment. Doing something is always better than just watching, only you feel like an ant in the funnel of the ant lion. The large accumulations of plastic represent actually only the tip of the iceberg, much more dramatically (from my point of view) is nevertheless the situation by the already decayed material which surfs as microplastic by the oceans. But a solution will be much more urgent because the plankton eaters pump themselves full with the microplastics and in the course of the food chain the plastic ends up on the plate. If the chain does not break down earlier, because the nutritional value of the microplastic is exactly zero. Swimming pool, swimmer washes his hair with a stuff which contains microplastic as a peeling additive, does not rinse his hair thoroughly and the stuff is also in the bath water.... there is still a filtering possible... and also still ´ne simple thing because yes only must be filtered.........but how one separates Plakton from plastic in the sea ??? The stupidity is round. Nobody knows where it starts and where it ends. ... and? "Put your hands in your lap" and do nothing? There are already some approaches (and there will be more and more) to prevent the spreading and recovery of the easily collected and visible garbage. Some experts are already thinking about genetically modifying "oil-eating" bacteria in such a way that they can also eat plastic ... but that would also cause other problems. My ideas around the "floating islands of garbage" go further than just collecting the floating plastic - plastic can easily be broken down into its chemical components ... or newly converted into "non-toxic" forms and with binding agents (sand, shell/coral limestone, tang/plant fibres, etc. ...) into building material for the islands and the further infrastructure. If you think "big enough", even "artificial lagoons" with purified/filtered sea water can be created between islands ... but these are again only precursor ideas. Looks like a Good Place to Start. I'm always trying to involve people (or groups) with "VIP status" in this discussion in order to enhance the topic and achieve more interest+participation. Here's a device that could have saved a hell of a lot of waste over the years. It's just a local German problem and not directly related to 'plastic polution', but the plans of RWE to lumber Hambacher Forst, just to get more area for brown coal surface mining is pi$$ing me off ATM. It is the biggest hole on earth already and they want to increase it although they don't need that coal in the near future. ... yes -- this is one sample for "bad" environmental interactions even in countries, positioning themselves as "environmental friendly"
But... more bigger more better? I kid, I kid. That's what they call "potential for growth". Coal can be sold even if you don't need it yourself, so digging a bigger hole is just digging more money as far as they are concerned. Until coal stops being a very useful and sought after resource, they'll want to keep digging. You can't call yourself 'environmental friendly' and then sell this crap to others! 1to of brown coal produces 1to of CO2. Plus the polution to transport it to Australia or China. But I also saw others made of shredded CD's or PC-cases made of ABS, which were mixed with silicone - they were then rather "airtight". If the binder/adhesive itself is environmentally harmless (e.g. lignin/vegetable resin, currently a waste product of paper production), then only the embedded particles have to be appropriately selected - e.g. sand/lime or the collected waste plastic, by "thermal reduction" converted into carbon chunks -- and the extracted/vaporized toxic components otherwise bind or "chemically break down". Like, crawling under the desk would help against the H-bomb. Just saw a report about a new plastic made from chicken feathers. The source is cheap and would usually be burnt. A win_win for our planet. The Catan games are about discovering (unknown) countries and islands and building an infrastructure (settlements and roads) to build new settlements and roads with the resources earned in the settlements (or around them) ... doesn't this seem familiar if you think about the construction and "settlement" of the "floating islands"? Reminds me of Kevin Costners 'Waterworld'. ...not the place they wanted to be and everyone was dreaming of 'Dryland'. That already happens in the Netherlands: floating houses connected to each other. Seems that Floating Plastic Islands are teeming with nasty bacteria, so your going to need a real virulent non toxic competitor. ... it's more a decision, what to "terraform" first - moon, mars or "ye ole earth"
Ruining the Earth is a world government conspiracy, to give them all jobs to do going forward, create the problem, then become the solution. Where would the 'soil' come from that covers the plastic island? A good fertile ground can't be made easily. We'd have to steal it from somewhere. Those garbage collections are far away from any current or coast. In the eye of the hurricane if you will. It would cost a fortune to get goods delivered. We'd better grow trees and fertile soil in Sahara, where people really need it.